Say hello to who?!?! You read it correctly, the all new Rock Bug. What exactly is a Rock Bug? The Rock Bug is an all new buggy design straight from the labs of Spidertrax. 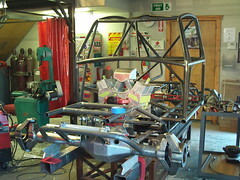 Get ready, what we are developing here goes way beyond your typical chassis build. The goal of the Rock Bug is to create a whole new platform for aggressively testing the working limits of ultra high strength, ultra light weight product designs. When we say working limits, we aren’t talking just about show and shine either. The Rock Bug is set to debut at the 2009 King of the Hammers competition, driven by its proud owner, rock crawling champion Tracy Jordan. We just got started so sit back, relax, hit refresh on your browser a million times, and enjoy the progress. We will be posting updates here, as they happen, and will make a point to highlight all the new innovations the Rock Bug brings. Be sure to check out our Flickr photo & video set too at http://www.flickr.com/photos/spidertrax/sets/72157609473800091/. Till next time!